The links at the top of the site can walk you through the entire process. If you’re interested in contributing, contact us and/or see our project page on GitHub . Version 1.1.0 is a significant improvement, released to the public today. This new version includes the updated dependencies WiiUse 0.14.0 and a pre-release of VRPN 07.29. 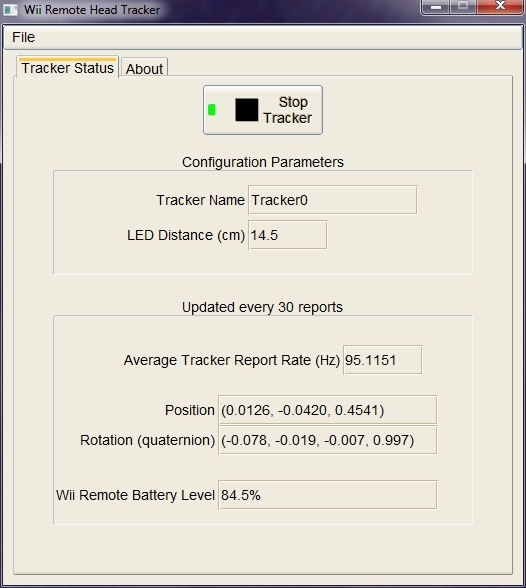 The GUI now supports the threaded (non-blocking) continuous connection to the Wiimote added in recent VRPN versions, so the Wiimote can disconnect and re-connect without shutting down the tracker (at least on Linux). It also provides a sensitivity adjustment (matching that of the Wii) allowing you to increase or decrease the camera’s sensitivity to IR light. This should increase tracking robustness substantially. For more screenshots, see the documentation on installing and using the system. This application builds on the Wii Remote Head Tracking filter module for VRPN by providing an easy-to-use, fully-integrated tracking server. Pavlik, R.A., and Vance, J.M., 2010, “A Modular Implementation of Wii Remote Head Tracking for Virtual Reality,” ASME Paper No. WINVR2010-3771. Proc. 2010 World Conference on Innovative Virtual Reality. See the home page for more information on attribution. Web site template based on a design by edg3.co.uk, used under the Creative Commons Attribution 2.5 license.